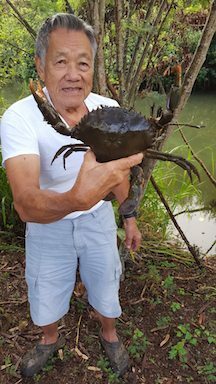 My name is Russell Hu and me and my dad, Tyrus Hu caught what I believe to be a Hawaii State Record Female Samoan Crab on November 10, 2017 in Kaneohe Bay. This crab was caught from the shore in five feet deep water. We took its measurements and weight with a digital scale that I own. After taking our pictures of it, we released it back into the water unharmed. A 8 ¼ inch female is a very big crab. Thank you for printing a fisherman magazine for all us fishermen to read and enjoy.